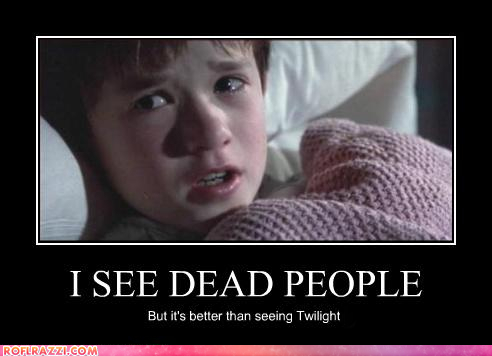 I see dead people. . Wallpaper and background images in the Critical Analysis of Twilight club tagged: twilight the sixth sense better than twilight caption anti funny. OMG I LOVE THAT MOVIE!! Haley Joel Osment! :D I remember him from the Artificial Intelligence movie. That movie made me cry buckets! Haha. This movie gave me nightmares for years when I was a kid. I'm still a little afraid to sleep with my legs off the bed. yes very sad movie !!! I love this kid! Obviously he isnt a kid anymore, but I also loved him in 'Pay it forward' Amazing actor. LOL, at the caption though. im crying from laughing smuch.